I don’t see what the big deal is about UFOs. Arguing about whether they exist is entirely different from arguing about the existence of unicorns, Bigfoot, or even ghosts. One may justifiably doubt the existence of entities in the latter group for want of convincing evidence, but however certain one may be that they are imaginary, it does at least make logical sense to say they could exist. And I think that if someone actually dug up a unicorn skeleton somewhere and it passed scientific scrutiny, we’d all say, “Well, I guess we were mistaken in the belief that they didn’t exist,” and that would be that. But it does not make any more sense to claim that UFOs don’t exist than to claim that uncertainty doesn’t exist. Have you ever looked up and seen anything in the sky you couldn’t identify? Guess what: that was a UFO, an unidentified flying object. Get over it. Someone else may have been able to identify it, in which case—for that person—it would be an FO. But of course, what most people mean when they say “UFO” is “alien spacecraft.” That, I’m afraid, is in the unicorn category. You can’t prove such a thing doesn’t exist, but until someone produces the goods and it passes muster with the world’s experts, most people are going to remain agnostic, at best—as they should. I mention this not only because ball lightning is a phenomenon with just the same sort of ontological uncertainty, but also because it has been alleged to have other connections with UFOs (in the usual sense of the term). At this point, you probably want me to tell you what ball lightning is—what exactly are we actually talking about here?—and this, unfortunately, is only slightly easier than answering how long a unicorn’s horn is. No one can really say precisely, at least not in any verifiable or authoritative way. But very casually speaking, ball lightning appears to be a bright, often colorful, electrical discharge that is more or less spherical (ranging from roughly volleyball-sized to beach ball-sized), that hovers or moves through the air seemingly of its own volition, that may or may not cause any lightning-like damage, and that persists for much longer than regular lightning (a few seconds, or, in some cases, more than a minute). It typically occurs during thunderstorms, but may appear indoors (or even, say, on an airplane) as well as outdoors. Because ball lightning occurs rarely and—as far as anyone knows—randomly, it resists scientific scrutiny. And attempts to produce the same effect in a laboratory have been largely unsatisfying. For these reasons, many scientists are tempted to believe ball lightning is imaginary, or at least an inaccurate description of some other perfectly ordinary phenomenon. For example, some people attribute this effect to the afterimage that persists for a few seconds after seeing a bright flash of light (in this case, lightning)—although this explanation fails to account for many of the reported features of ball lightning. On the other hand, the apparent similarity of ball lightning to things we’re all familiar with (lightning, fire, and plasma, for instance) suggests that it could be a real, natural occurrence after all—just one we haven’t figured out yet. 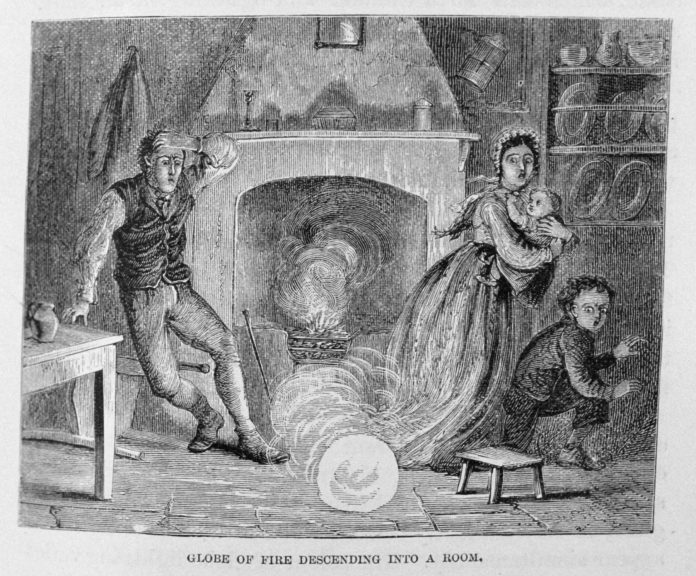 Although thousands of people have reported seeing ball lightning (with tremendous variety in the details, of course), researchers—some of whom have studied these reports for decades—have more questions than answers. If it’s an electrical discharge, what’s doing the discharging? If it’s plasma, how is it contained? If it’s a ball of fire, what is the fuel? Does the energy that produces this light come from inside the ball, or outside? There are plenty of theories, but none of them is conclusive. Ball lightning is assumed to be related to another phenomenon, known as St. Elmo’s Fire, which also appears to be an electrical discharge, but which invariably clings to (or moves along) a conductor and which can persist for upwards of an hour. But St. Elmo’s Fire occurs with similar infrequency and has not been explained fully, so one can’t say with certainty that ball lightning is a variety of St. Elmo’s Fire or vice versa. So what about that UFO connection? Well, there are, naturally, those people who claim extraterrestrial (or even supernatural) origins for ball lightning. But more often, ball lightning is cited as an “explanation” for alleged UFO sightings. Give me a break. There’s nothing like explaining away one inscrutable phenomenon with another. We don’t know what ball lightning is, or in fact whether it’s a natural occurrence at all. So saying that what someone thought was a UFO was only ball lightning is like saying that the creature you saw wasn’t Bigfoot at all—it was really a giant leprechaun. OK, that’s probably a bit unfair, but still—let’s practice responsible skepticism. And by the way, if you see an electrical discharge hovering at the tip of a unicorn’s horn, I can assure you that it’s only St. Elmo’s Fire. Note: This is an updated version of an article that originally appeared on Interesting Thing of the Day on April 9, 2005.